New aerial drone technology could change the landscape of Australia's billion-dollar wheat industry by delivering cost-effective mechanisms for farmers to plan and deliver precise water and nutrients to their crops on a need-by-need basis. Lead researcher, Dr. Zohaib Khan from UniSA's Phenomics and Bioinformatics Research Centre, says the new technology is a welcome development for the annual $5 billion+ Australian wheat sector. "Drones enable farmers to move from traditional farming practices to precision farming, increasing their ability to accurately nurture crops across different sectors, at a reduced cost," Dr. Khan says. "Until now, the drones required an expensive multispectral camera to scan agricultural land and indicate where there is a need for additional irrigation or application of fertiliser to selected crop segments. "Multispectral imaging technology lets farmers see beyond the naked eye, allowing them to be proactive rather than reactive about their crops. "Just as satellites map the Earth's resources, drones can produce colour-coded images that show the presence and state of vegetation on land—from crop performance, to disease detection." The technology identifies healthy plants exhibiting a high vegetation index—shown as bright green regions—and mature, stressed or dead plants and soil manifesting a low vegetation index—displayed as yellow areas. The newly-developed technology delivers this information using RGB (red, green, blue) cameras, a standard accessory carried by drones. 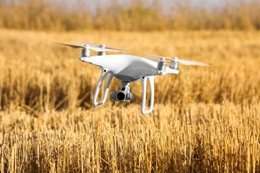 The drone flies about 20 metres above land, capturing one image of a section of a crop field every two seconds. This data is then processed offline and modelled into useful information through deep learning—all without the additional cost of a multispectral camera. Professor Stanley Miklavcic, Director of UniSA's Phenomics and Bioinformatics Research Centre, says the technology will deliver important insights for Australia's farmers. "Wheat production is an important industry for Australia, yet to produce high quality Australian wheat in a hot and dry climate, farmers rely upon the development of resilient varieties," Prof Miklavcic says. "When you're growing crops in the driest continent in the world, being able to identify stress-tolerant crop varieties is critical—and this is where our new technology can help. "It's ironic that Australia's weather both facilitates and constrains Australia's wheat production and superior quality. "But anything we can do to advance and improve existing knowledge and technology, as well as make it accessible to Australian growers, is absolutely worth the effort." Published in Plant Methods, this research was part of the Industrial Transformation Research Hub for Wheat in a Hot and Dry Climate, sponsored jointly by the Australian Research Council and the Grains Research Development Corporation. We are confident that new developments with drones including additional sensor types, AI and other applications will fundamentally alter how farming is conducted and the yields we can achieve on a farm. Let the innovation games begin.